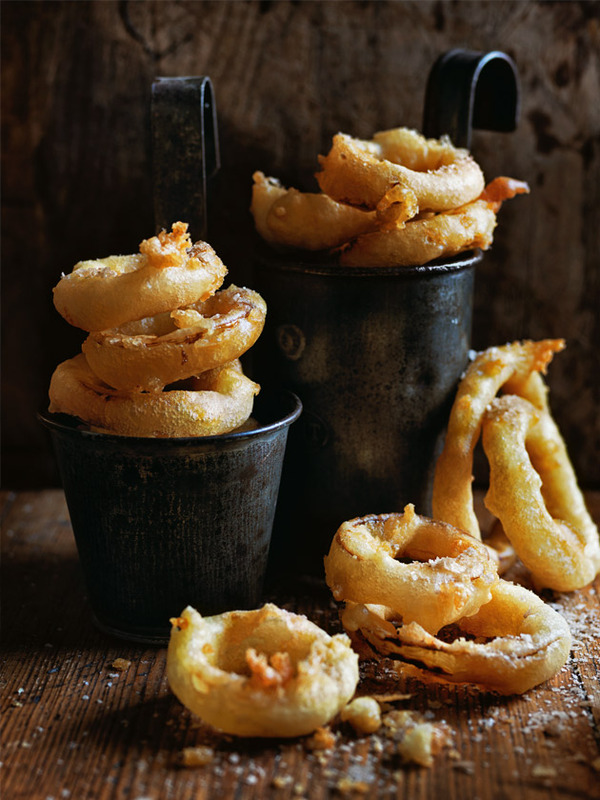 Place the onion, vinegar and salt in a large bowl, separating the onion into rings. Set aside for 1 hour 30 minutes to marinate. Drain the vinegar mixture from the onion. Place the self-raising flour, sugar, soda water and 2 cups (300g) of the cornflour in a large bowl and stir to just combine. Place the remaining cornflour in a separate large bowl. Half-fill a large saucepan with the oil and place over medium heat until it reaches 190°C (375°F) on a deep-frying thermometer. Working in batches, dust the onion in the reserved cornflour, dip in the batter and cook for 2–3 minutes or until golden brown. Remove using a slotted spoon, drain well, sprinkle with smoked salt and serve immediately. Serves 6.